Mixed martial arts bouts in Saint Robert may 29th! 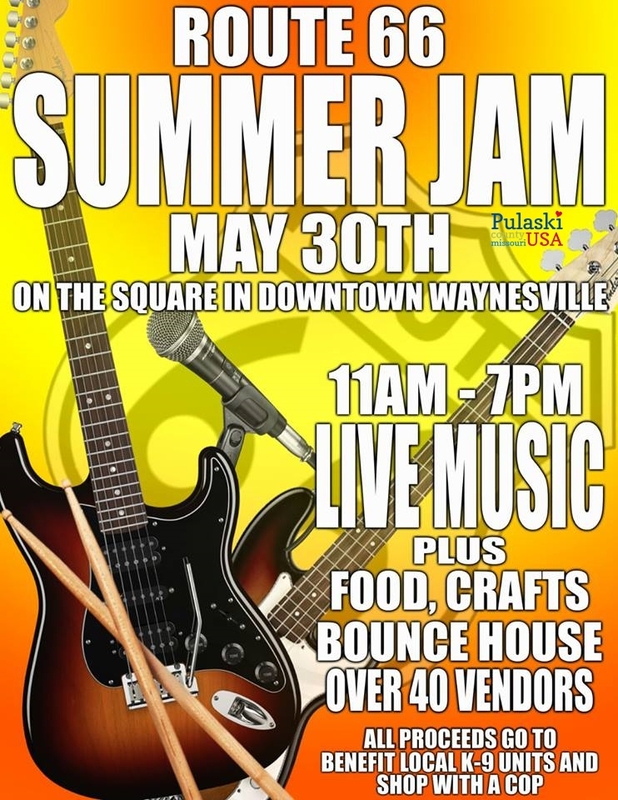 Music festival on Route 66 in downtown Waynesville May 30th! 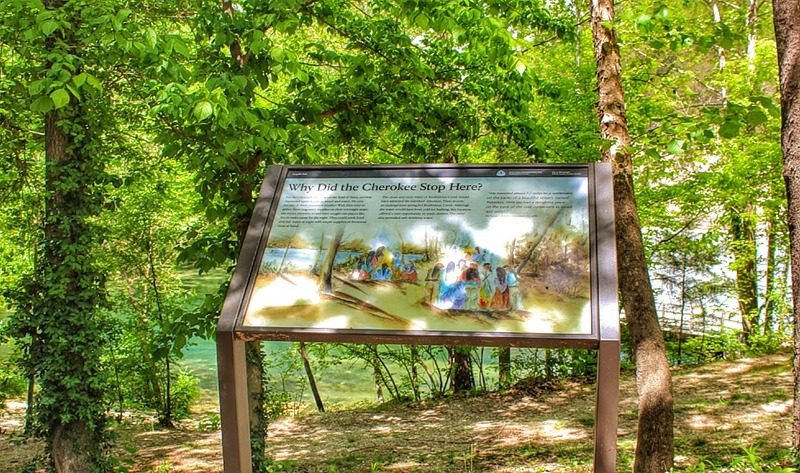 In 1830 Congress passed the Indian Removal Act, providing “for an exchange of lands with Indians residing in any states or territories, and for their removal west of the river Mississippi.” This act changed the Cherokee Nation forever. Their leaders fought against this act but by 1832 they were running out of options. One by one, sometimes in chains, tribes were removed. The Choctaw, the Muscogee Creeks, the Chickasaw, the Seminoles were all forced from their homelands and moved to Indian Territory-now known as Oklahoma. In 1835, acting outside the authority of the Cherokee government, 20 tribal members, led by Major Ridge, signed the Treaty of New Echota. The conditions for removal were set: In exchange for $5 million the tribe would relocate to Indian Territory. Though the majority of Cherokee protested the agreement it was enacted into law by Congress in 1836. The treaty gave the Cherokee two years to voluntarily move. Not surprisingly, most Cherokee refused to recognize the Treaty of New Echota. Few had moved at the end of the two year period. In 1838 General Winfield Scott and 7,000 soldiers, began a removal effort in Georgia. Cherokee families were uprooted and driven-sometimes at bayonet point to removal camps. In June of that year Cherokee were loaded by the Army onto flatboats and moved to Indian Territory. The first boat completed the journey in 13 days. Desertions and fatalities plagued the next two groups and the poorly supplied boats were ravaged by disease. To save his people, Principal Chief John Ross petitioned General Scott to let the Cherokee control their own removal. Ross organized detachments of about 1,000 each and the Cherokee traveled by foot, horse, and wagon for 800 miles, taking up to eight months to reach Indian Territory. Two of these detachments camped at Roubidoux Spring in Waynesville- in December 1837 and March 1839. Details of these camps were recorded by Dr. W.I. Morrow, Reverend Daniel S. Butrick, and B.B. Cannon in their journals and diaries. The Cherokee suffered terribly during the hard winters. 15,000 Cherokee were forced from their homes and many hundreds died on the journey. Seventeen detachments of Cherokee arrived in Indian Territory in 1838 and 1839 and the tribe members began rebuilding their lives. Today the Cherokee and other removed tribes endure as vigorous Indian nations. 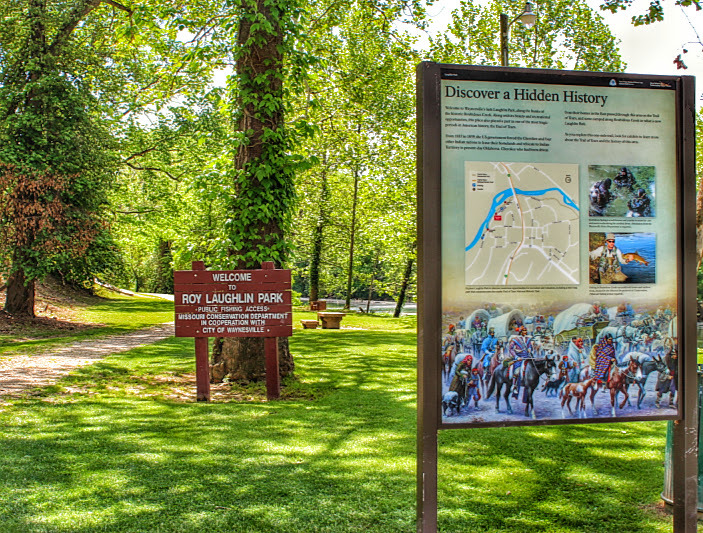 The City of Waynesville and the Downtown Beautification Committee applied for, and received, certification as a site on the Trail of Tears National Historic Trail and in October of 2006, a Certification Ceremony was held in Laughlin Park, on the banks of the Roubidoux Creek. 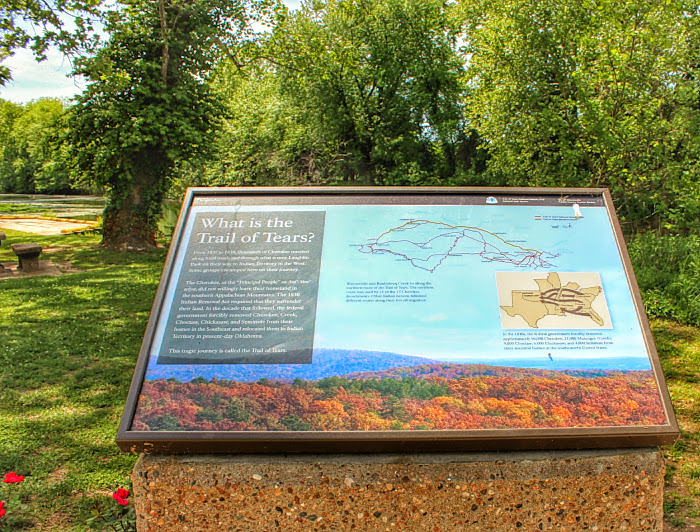 The National Park Service was represented by Aaron Mahr, who presented the certificate, and the Missouri Trail of Tears Association was represented by Deloris Wood. Laughlin Park is one of only seven certified sites in Missouri. Two others- Maramec Spring Park and Snelson-Brinker Cabin are only 45 miles from Laughlin Park. Certified sites can also be found in Pilot Knob, Springfield, Cassville, and Jackson. 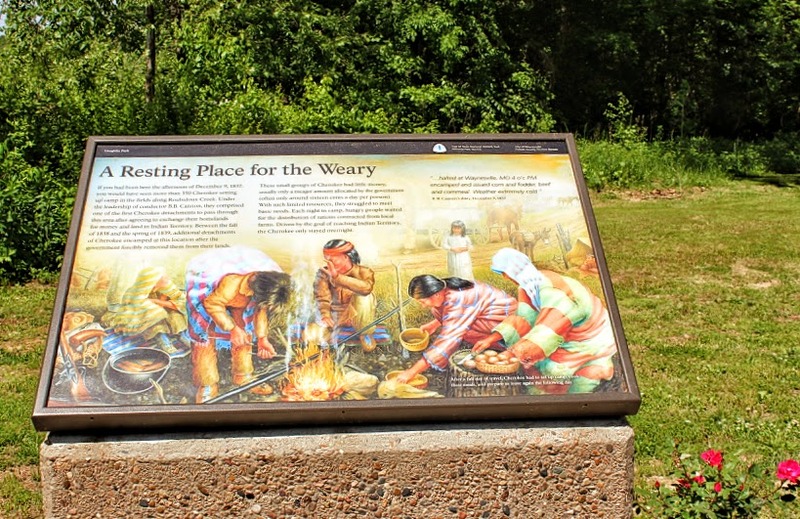 On June 19th, 2015 The City of Waynesville, in conjunction with National Park Service, Trail of Tears Association, and Pulaski County Tourism Bureau will unveil seven Trail of Tears Wayside Exhibits. 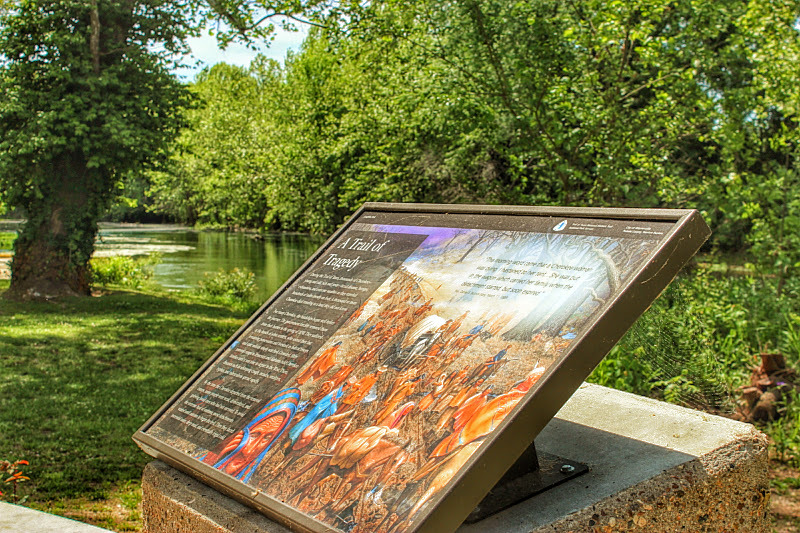 The exhibits begin at Roubidoux Spring and are located along the mile long walking path that follows the Roubidoux River. The event will begin at 9:00 a.m., rain or shine. The public is cordially invited and encouraged to attend. A reception, provided by Vidie’s Catering will follow. Honored guests will include the Cherokee Remember The Removal Riders. 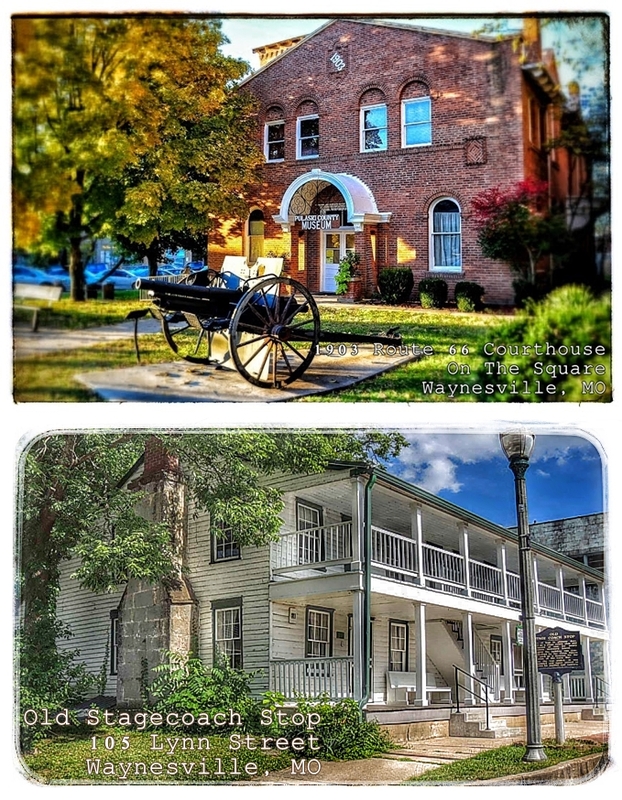 Ten Reasons To Attend 2015 NSS Convention In Waynesville, Missouri! 1. NSS Convention 2015 is centrally located in the Mississippi Valley-Ozark Region (MVOR). Whether you normally cave in ARA, MAR, NRO, NCA, SERA, SWR, TSA, VAR, Western Region, or the Rocky Mountain Region- #NSS2015 is within reach! 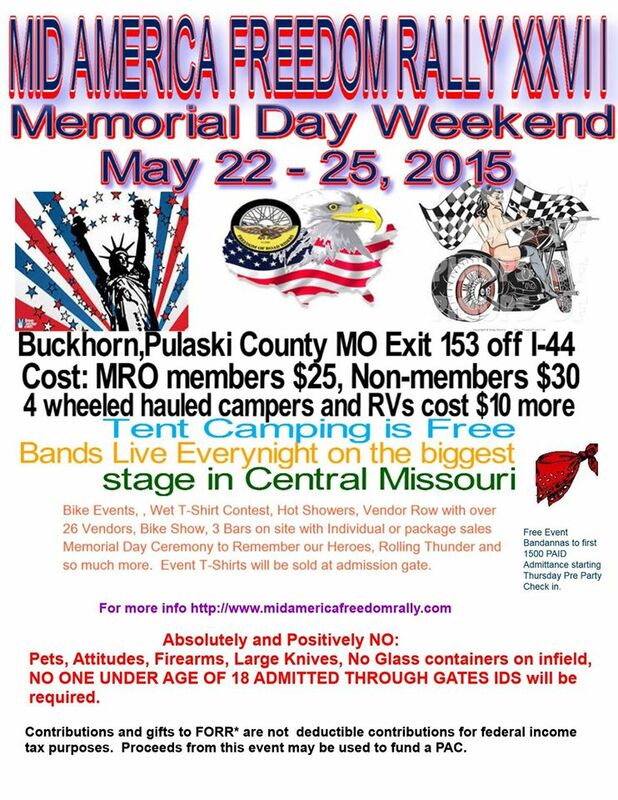 Convention Central and Campground are both easily accessed via Interstate 44! 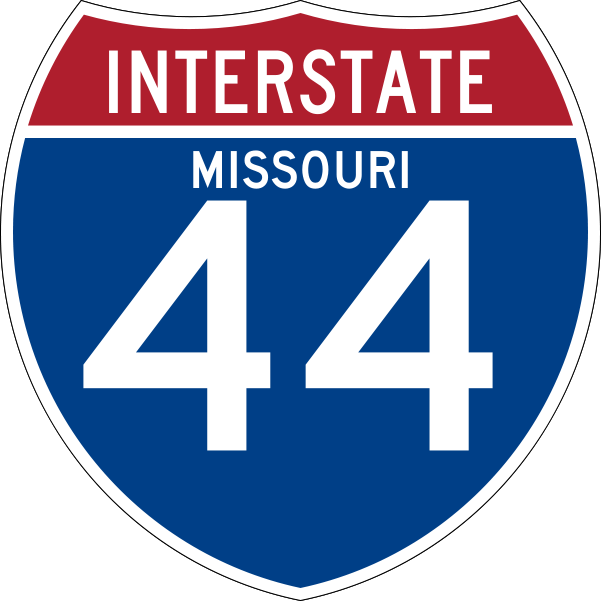 #NSS2015 Convention Hall and Campground are both easily accessed via Interstate 44! 2. #MuddyCaveMonday! And Tuesday, Wednesday, Thursday, & Friday! 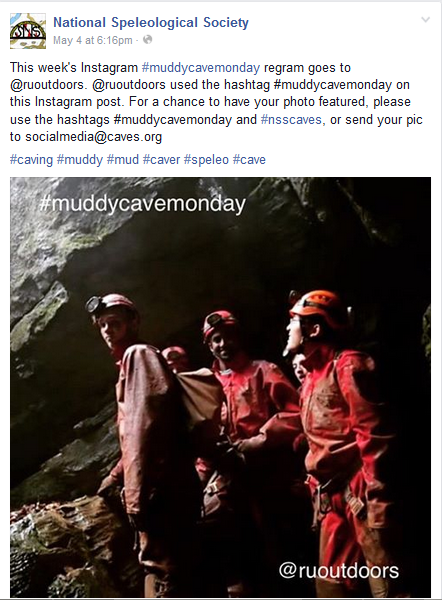 With 200 caves offered during Convention, most oozing with Pulaski County mud, you will have plenty of photo ops to submit to National Speleological Society (@Nsscaves) for the Muddy Cave Monday feature! 3. Affordability! From the gas pump, to lodging, to a night on the town- your dollar will have more bang for the buck in Pulaski County! Stretch it even further by asking for your free discount card at the Pulaski County Tourism Bureau booth at Convention Central. This is your passport to savings in town. 4. Campfires are welcome at Campground. Bring S’more fixings! 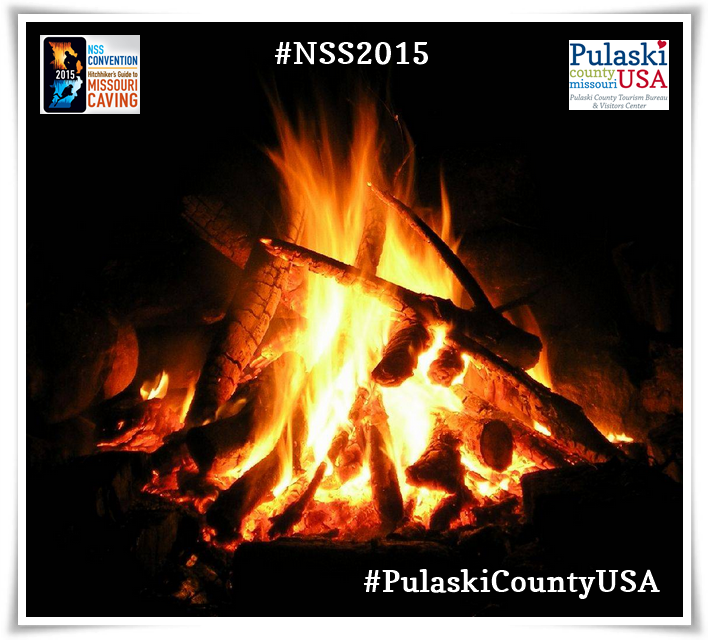 Campfires are allowed at 2015 National Speleological Society Convention in Waynesville, MO.! 5. Two of the best BBQ towns in the United States are in Missouri- St. Louis and Kansas City. Missouri’s BBQ isn’t confined to the big cities though. You will find lip smacking barbecue all across in the state- and at Campground and restaurants in Waynesville. 6. Concierge decontamination service will be offered at Campground. More time for you to relax and catch up with fellow cavers! 7. Fishing! 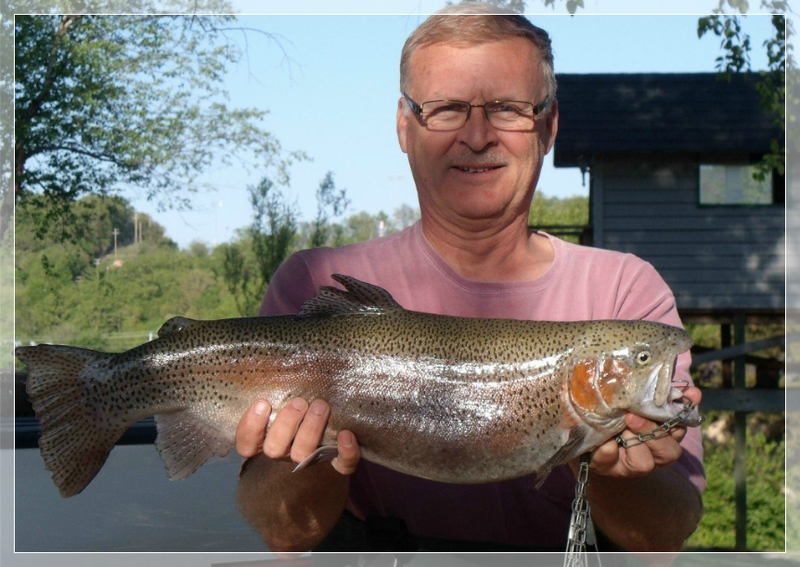 You can fish several Red & White Ribbon trout areas of the Roubidoux River, even in the heart of Downtown Waynesville. 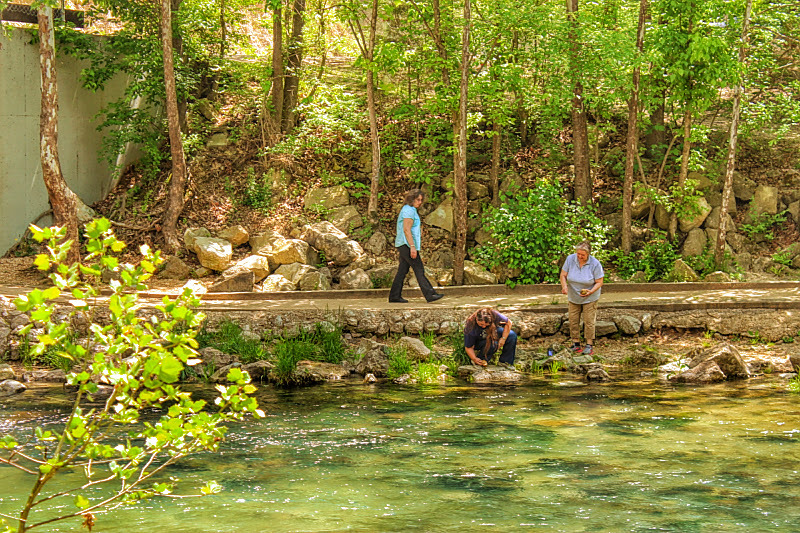 Bennett Spring and Montauk trout parks are also an easy drive from Waynesville. 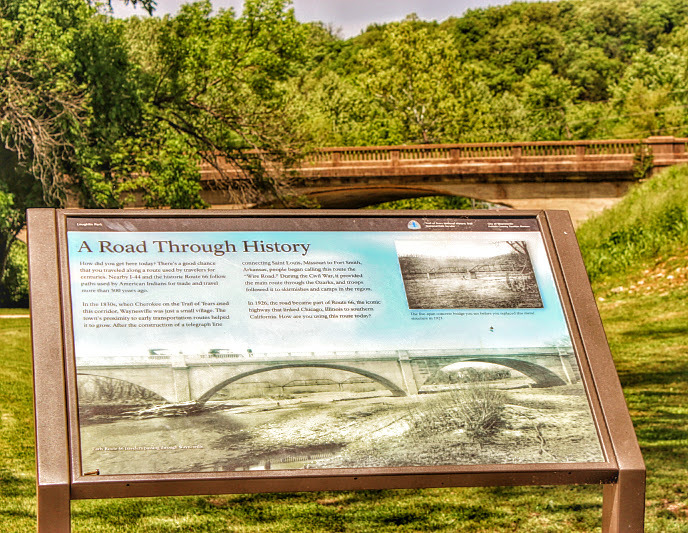 The Gasconade & Big Piney Rivers are well known for smallmouth bass fishing. Rainbow trout caught at Roubidoux Spring in Laughlin Park. Courtesy of Alan Clark. 8. 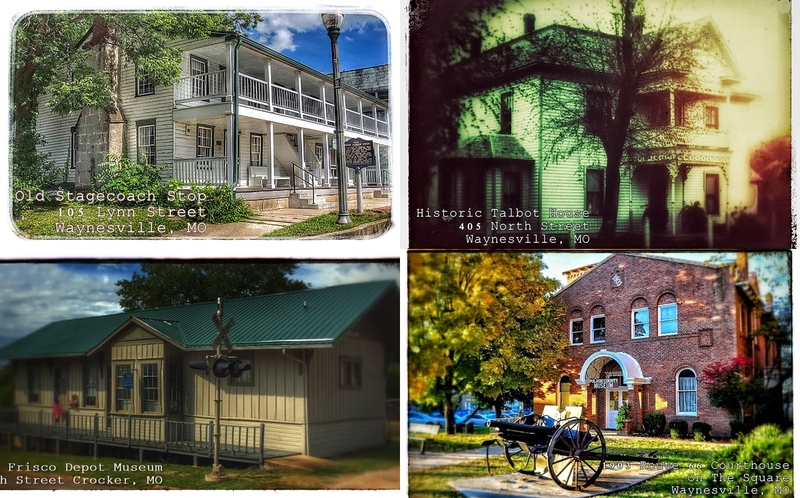 You can explore Route 66, tour the 1903 Courthouse Museum by head lamp, visit an Old Stagecoach Stop, try your hand at ghost hunting, raft a lazy river, go antiquing, shop for the perfect Ozarks keepsake, honor the Cherokee at the Trail of Tears Memorial, drink a local craft beer, splash in a spring- all within 20 minutes of Convention Central! 9. Enjoy the show! Discover show caves & Civil War battlefields, take a Missouri State Penitentiary tour in Jefferson City, explore a state park, follow in Lewis & Clark’s footsteps, bike or hike the KATY trail, view St. Louis from the top of the Arch, wish upon a fountain in the City of Fountains, or head to the live music show capital of the world in Branson. There is a lot to see and do in The Show Me State for the whole family! 10. Caving! 200 caves will be offered during #NSS2015! Register for 2015 NSS Convention today! 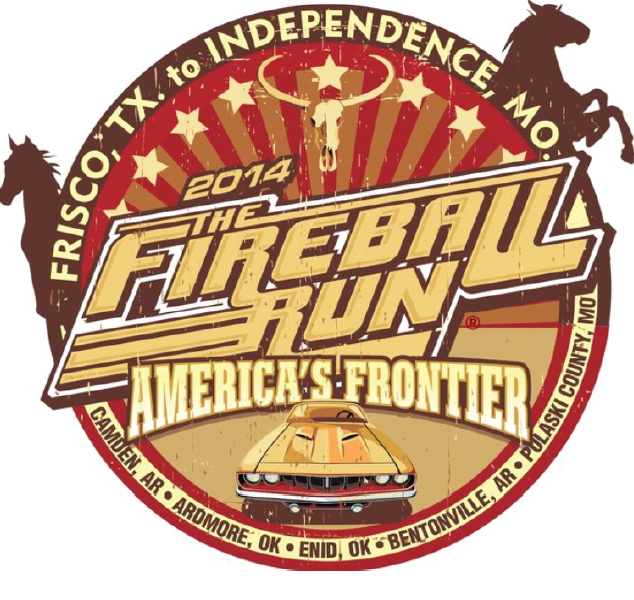 Online registration available through June 13, 2015!!! Save $20 by registering today! Order your FREE Waynesville/Pulaski County Visitors Guide! 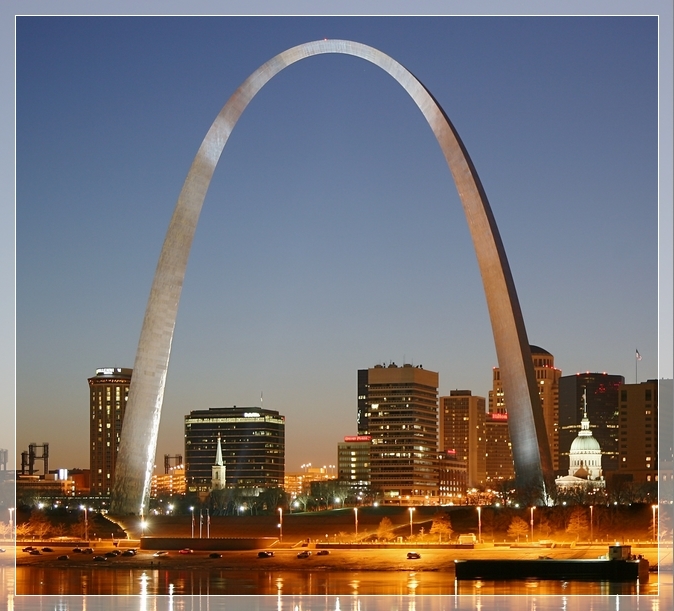 Order your FREE Missouri Visitors Guide! When: Gates open the 22nd at Noon, events runs through the morning of May 26th. Top 5 Places To Have A Flavor Party In Pulaski County USA! Delicious flavors explode in Saint Robert, Missouri! Pulaski County is the melting pot of Mid-Missouri and the local cuisine certainly reflects diversity. 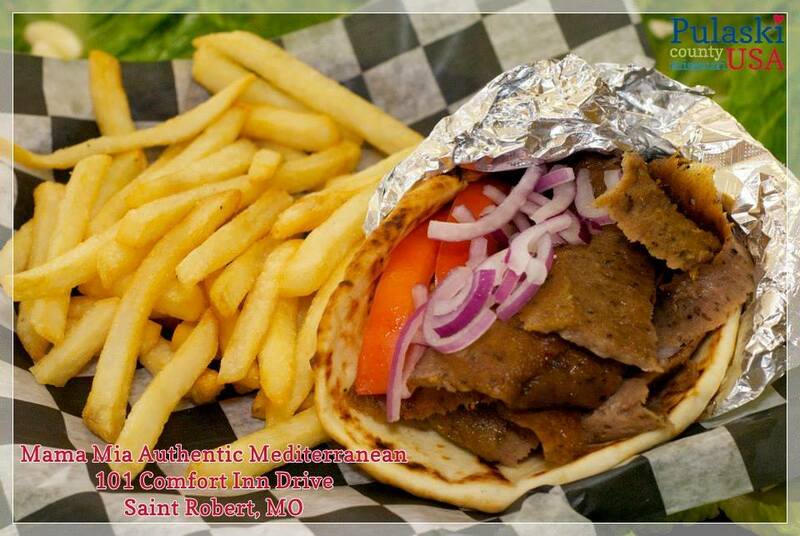 Four of St. Robert’s top five rated restaurants serve three different international cuisines: Korean, Mediterranean, and regional Mexican dishes. Traditional Ozarks BBQ rounds out the list. Grab your taste “buds” and bring your appetite to Pulaski County! 1. 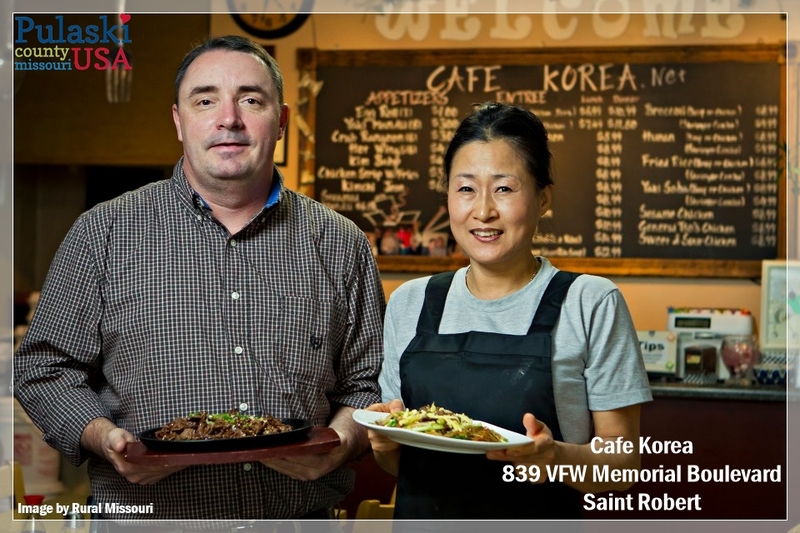 Cafe Korea- Chong Moore, owner of Cafe Korea, has been sharing her South Korean heritage, culture, and food with Saint Robert for almost five years. Her prepared to order, authentic dishes have been called the “the best of Korean cuisine in the Ozarks” by Rural Missouri magazine. Raised in her Mother’s kitchen, Moore prides herself on the freshness of her ingredients. She and her staff hand slice the meats that they marinate for 24 hours before creating their “ma shee suh yo” appetizers and entrees. 3. Don Jose Unique Mexican Bar & Grill- A relative newcomer to the St. Robert food scene, Don Jose’s has a lot of buzz- and a lot of 5 star reviews. 4. Cancun Mexican Grill- CMG serves dishes inspired from the coasts of Mexico. The Yucatan peninsula has a style of food all of its own which you can find in many restaurants in Cancun. The culinary delights of a typical Yucatecan kitchen come from a mouth-watering mixture of Mayan, Caribbean, Dutch, Lebanese, and Spanish flavors. 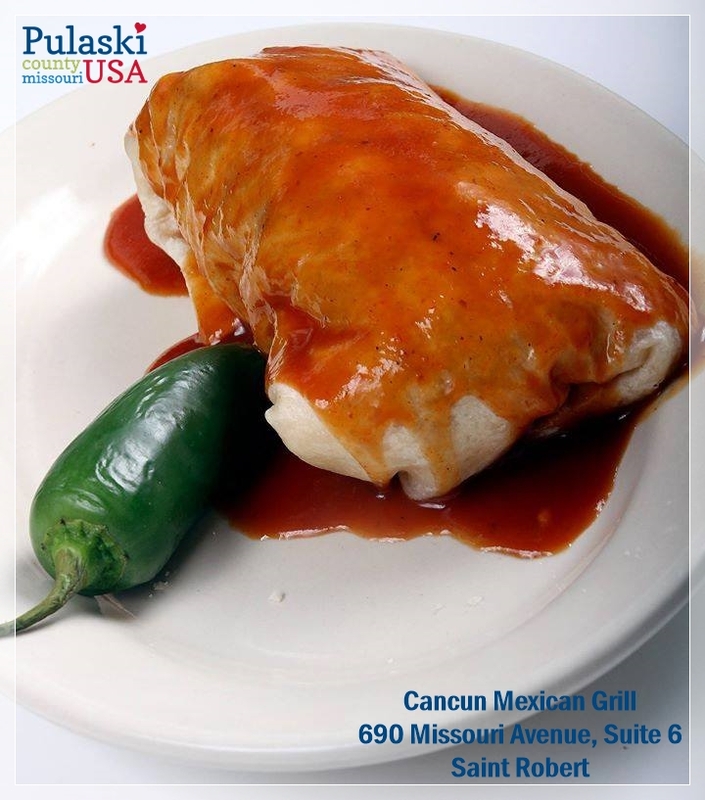 The dishes at Cancun Mexican Grill have been described as authentic, flavorful, and delicious. The Warrior Burrito is a top seller and is a local favorite. 5. 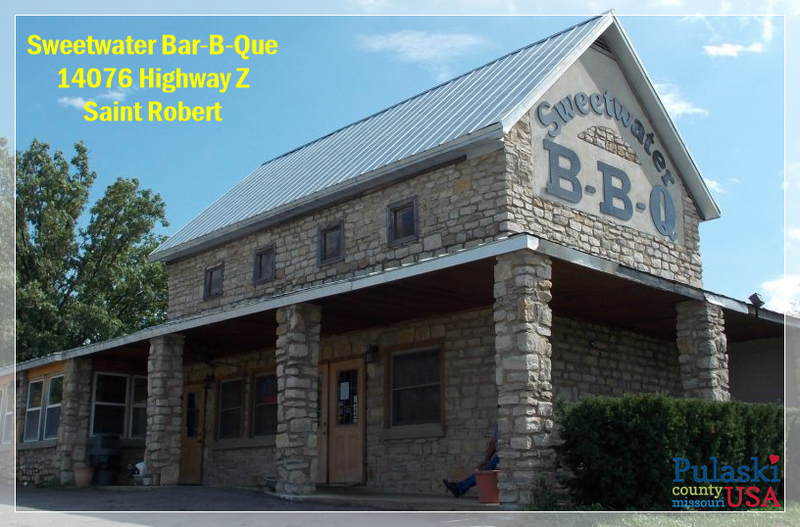 Sweetwater Bar-B-Que- Beginning in the 1820’s industrious, enterprising men began floating rafts of railroad ties down the Big Piney River, into the Gasconade River, and downstream to Arlington. These rough and ready tie-rafters named landmarks along their journey. In Pulaski County, on land that is now part of Fort Leonard Wood, between Crooked Chute and Spring Creek Eddy was Sweet Water. Sweet Water was a long, swift stretch in the river. Rafters looked forward to this spot on the Big Piney because it was “sweet going”. Today, folks look forward to a different type of sweet water- Sweetwater Bar-B-Que on historic Route 66 in Saint Robert- not far from the banks of the Big Piney River. Sweetwater shouldn’t be hard to find- just roll down your window as you approach Interstate 44 Exit 163 and let the savory aroma guide you into the parking lot. 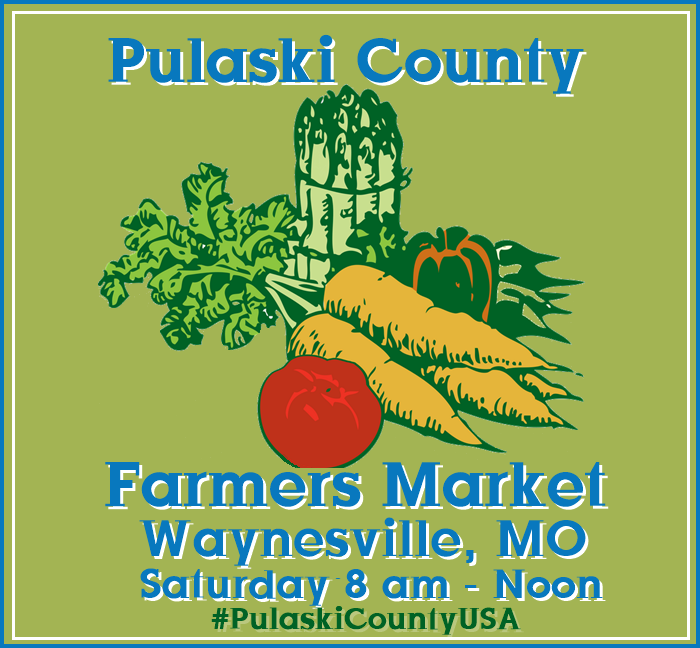 ** For a full listing of area restaurants, including corporate brands, please visit http://www.PulaskiCountyUSA.com.